The Bakers Pride Oven company, which claims to have invented the modern oven for mass production of pizzas was founded in the mid-1940’s in Bronx, New York. Since then, the company has developed a wide range of equipment for commercial kitchens and other applications like broiling, heating, cooking equipment and ovens. To comply with the stringent food safety norms, Bakers Pride also has a wide range of kitchen supplies starting from heavy duty stands, decks, vent fewer hoods. For heating and frying applications, fryers, hot plates, stockpots, griddles, char-broilers and cheesemelters are also available in different sizes and specifications. The company manufactures a wide range of ovens like Deck ovens, convection ovens, and countertop electric ovens. The countertop ovens are suitable for use in smaller commercial kitchens which do not have sufficient space for a deck oven. These ovens are available in a variety of configurations with the number of baking chambers and size of the baking deck varying according to the model selected. Most of the deck ovens are using electricity as an energy source, though an oven using propane gas a fuel is also available. The Baker’s Pride Electric Countertop Pizza Oven is a more compact oven model suitable for finishing the cooking of a variety of frozen items like pretzels and pizzas with a crust and heating them if required. 1. 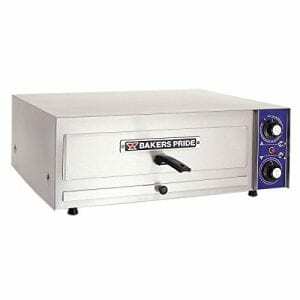 The PX-14 Electric Countertop Oven from Bakers pride has a deck height of 3 inches, making it suitable for applications where space is limited. The oven has an option to allow independent control of temperatures at the top and bottom for greater flexibility while heating. It has a timer for adjusting the cooking time to up to fifteen minutes. 2. The timer has an option for a continuous alarm to alert the user, and manually shut off when not required. The baking rack used in the oven is made from wire and will slide out as required, for placing or removing the pizza or other food items, and also for cleaning. 3. The temperature in the PX-14 electric oven can be adjusted between 284 and 680 degrees Fahrenheit depending on the temperature required for cooking the pizza, pretzel or other food items. The heating elements at the top and bottom of the oven are made from Incoloy. 4. The baking chamber of the oven is made from aluminized steel, is welded during manufacturing to withstand high temperatures, heating without affecting its performance in any way. The power consumption of the PX-14 countertop pizza oven is 1500 watts, though it may vary depending on the temperature settings of the oven and the food item being cooked. 5. The exterior of the PX-14 pizza oven is made of stainless steel, which does not get corroded easily when exposed to water, and can be cleaned. The oven has a crumb tray made of steel which can be pulled out whenever required using the knob. The baking wire rack has an insulated handle which allows the heated rack to be removed safely and quickly. 7. The entire PX-14 electric pizza oven is fully insulated to prevent any kind of electric shock. A six-inch electric cable with plug is supplied for connecting the oven to a suitable power supply. In addition to the standard American power supply of 120 V, the oven model is also available for international power supply ratings like the 240 V power supply. 8. The item has a weight of 45 pounds. It conforms to all the widely recognized quality norms for ovens of the size and rating like Underwriters Lab, UL, NSF, SA, CE, so buyers of the oven can be assured that they are purchasing a quality product for safe cooking. A one-year limited warranty is offered on the electric oven. – temperature range for heating can be controlled as required over a wide range depending on the pizza or other food item being heated. – the temperature for the top and bottom heating in the oven can be modified separately according to the food item being cooked, allows more control. The user manual and operation manual for the PX-14 Bakers Pride Oven are available and can be downloaded from the website of the manufacturer. It is highly recommended that the user should read the manual thoroughly and follow the instructions before installing the oven, to ensure optimal performance of the oven, and smooth operation of the open, with fewer repairs and less maintenance. Replacements parts and customer support for the oven are available from Bakers Pride company and its network of dealers. So the Baker’s Pride Electric PX-14 model Countertop Pizza Oven is a well designed versatile quality oven suitable for smaller restaurants and takeaways. If you liked the post then do share it on social media! It is always a delight having sophisticated gadgets in your kitchen that are able to perform at their optimum and also create a sense of beauty along with the amazing features. That’s exactly what the Breville BOV845B55 Smart Oven Pro does in a home. It is an awesome device that will surely lighten the kitchen and illuminate the spirit of Christmas. This is an absolutely ideal gift for this festive season, especially for that deserving wife who has struggled with a conventional gas oven. Breville has carved a niche for themselves in the household appliance industry with their lovely range of household appliances that have become so popular even in the UK. customer is that the product must not have exceeded 30 days from the date of receipt of shipment. Simply contact them for a Return Authorization (RA) number and start processing the return of the product. Interior Light: The new Breville BOV845B55 Smart Oven Pro comes with a beautiful inner light which comes in handy while checking the progress of food even in the dark. The light not only gives it an aesthetic look but also helps to brighten the inner chamber of the oven while it’s in operation. Longer warming time: For those who wish to utilize the warming feature that comes with this new model, the time of warming has been modified upward, and leftover foods can be warmed and preserved as fresh as ever. The warming is done at a lower temperature, which is preselected and absolutely easy to implement. Quick to heat: It is absolutely unbelievable to know that you can drop your food inside the Breville BOV845B55 Smart Oven Pro and within 2 minutes, the food is ready to be served. For those who can’t stand to be hungry for too long, this quick heating feature is a big deal. To add sugar on the icing, the heating is evenly spread on the food, thus making a perfect toast or roast or cooking as the case may be. Saves on energy: Part of the improvement made by the manufacturers of this device is the fact that it saves on energy as a result of the fast heating and the reduced cooking time. What it means is that t the end of the month, there is a drop on your utility bill and this makes economic sense. Durable and long-lasting: I took a lot of time going through user’s comments on the product, and it was nice to see that the product lasted long after the warranty had expired. It is durable and rugged. Some users even made use of the device thrice a day without any negative impact on its performance. Every product, no matter how good it may seem always has its downsides. The Breville BOV845B55 Smart Oven Pro Review will be biased if I fail to mention some of the noticeable complaints about this product. will become very difficult to remove. – Pull out the drip tray and clean it regularly. Allowing the drip tray to stay for long without regularly pulling it out and cleaning can cause rusting and it getting permanently stuck after a while. – Remember to switch off the power socket after usage. We all know the importance of switching off electrical appliances after use to avoid allowing them to run endlessly, which can cause severe damage. previous models and it works absolutely fine. It may be pricey, but itis worth every dime spent, notwithstanding few defects that are factory related. You can go ahead and get yourself possibly the best appliance on the market today. Wisco 412-3 Pizza Oven is a dedicated pizza oven that you can use to make great tasting authentic pizza. This oven is for pizza lovers or for someone who loves hosting a pizza party. However, do not limit this oven to just cooking pizzas and you can also grill and cook other savories like hot dogs. Wisco Industries Inc was originally named as Wisconsin Tool and Mold company when it was founded in the year 1949 to make tools, molds, mouse and rat traps. In 1968, the company designed and developed its first pizza oven for commercial applications called Pizza Pal. Since then the company has developed a wide range of pizza ovens for different applications as well as other products like convection ovens, Deli wrappers, and merchandisers to cater to the requirement of the food and restaurant sector. The products manufactured usually conform to the relevant quality standards. This Wisco 412-3 Pizza Oven Review will give you comprehensive information about the Wisco 412-3 Pizza Oven manufactured by Wisco Industries Inc.
1. The Wisco 412-3 Pizza Oven is an amazing pizza oven which was designed specifically for baking frozen pizzas with their original crust. The oven can also be used to prepare other frozen food items which are nongreasy like egg rolls. The pizza oven is designed to bake a 12-inch pizza in approximately 8 to 12 minutes. 2. The opening of the pizza oven for inserting and removing the tray is 13 inches long and 1 7/8 inches wide. 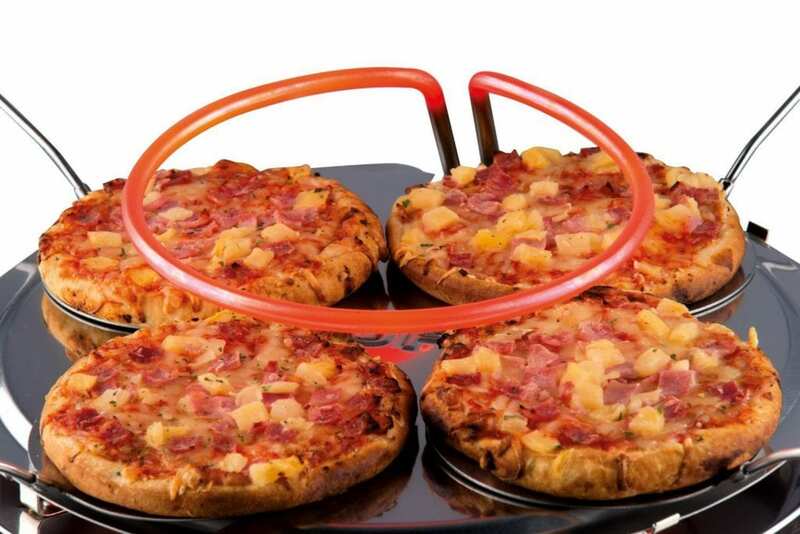 The tray can be completely removed from the pizza oven for cleaning purposes.The handle of the pizza oven can be flipped up if required so that the oven can be easily stored when not in use. 3. Stainless steel of 430 grade with 22 gauge thickness and brushed finish is used to make the outer housing and grill so that it does not get rusted easily and can be cleaned conveniently. 4. Aluminized steel is used for making the inner housing and other parts of the oven, as the aluminized steel will not get corroded easily when exposed to water. 6. The pizza oven has a preset thermostat with a temperature setting of approximately 535 degrees Fahrenheit. It also has a preset time of duration up to 15 minutes so that the cooking time for the pizza can be adjusted. Some users may thaw their pizza before putting it in the oven, so in these cases, the heating time required will be lower. 7. The pizza oven has heating elements made from wire so that the pizzas and other food items can be heated quickly and a larger number of pizzas can be cooked in the oven in the same time period due to the reduced cooking cycle, making it ideal for commercial kitchen applications. 8. Most of the buyers are very satisfied with the quality of the pizza oven as it is ideal for making pizzas using frozen medium crust pizzas. The burners and wired heating elements in the pizza ensure that the pizza is heated from both top and the bottom side, and is fully cooked. The butter in the pizza is also melted properly in this pizza oven. The pizza oven can also be used for baking a wide variety of other food items like hot dogs, french fries and garlic toast. The well-designed pizza oven is NSF certified, ensuring that it meets the quality guidelines for pizza ovens. 9.Fairly comprehensive documentation, user manual, and troubleshooting guide are provided for the Wisco 412-3 Pizza Oven making it easy for buyers of the pizza oven to set it up and ensure optimal performance of the oven. The detailed specification sheet, user manual, exploded view and wiring diagram are provided for the oven, making it easy for the user to troubleshoot any problem which he or she is likely to face. 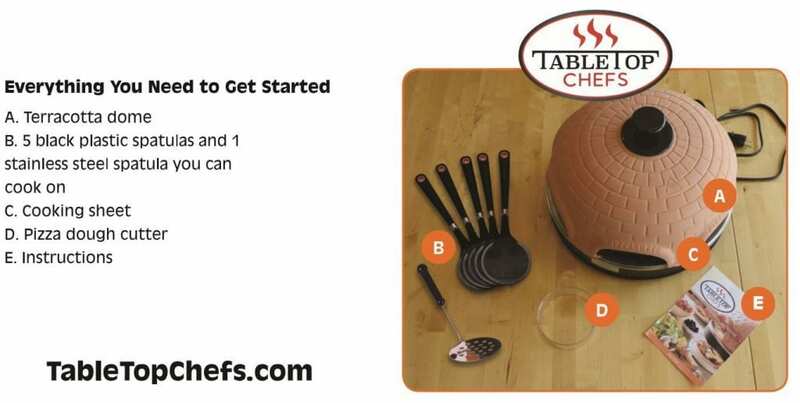 -Provision for adjusting the cooking time using the mechanical timer. 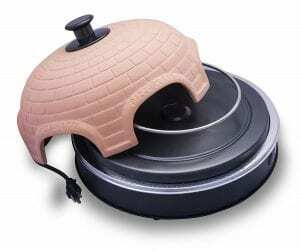 – Inexpensive pizza oven for the features and quality which it provides. -Designed for use for a long period of time, many users have used the same pizza oven for a period of ten years or more, so purchasing the pizza oven is a good investment. – Manufactured in the United States, spare parts easily available. -Manufactured from stainless steel and aluminized steel which does not get corroded easily and can be cleaned quickly. -Pizza is heated and cooked from both the top and bottom, unlike other ovens where the pizza may not be cooked uniformly. -Most users find it easy to use the pizza oven to make pizzas. – The pizza oven is not UL certified, it is only NSF certified. The UL certified version is more expensive. The Wisco 412-3 Pizza Oven is an inexpensive high-quality oven which is highly recommended for families who like to eat pizzas often, hold pizza parties and also for commercial applications. One of the greatest advantages remains the long life of the pizza oven, and it can be used for over a decade, without being replaced. Most of the customers who have purchased the pizza oven are extremely satisfied with the quality of the pizza oven and found it is easy to make quality pizzas in a short period of time using the pizza oven. The pizza oven can further e used for making hotdogs, egg-rolls and other recipes which you can easily find online. However, if you are looking for an authentic pizza maker that gives you the taste that you get in the pizzas from restaurants then this might be the best choice in the given price range. If you think that all ovens are the same, think again and consider the exact features you need. Basically, all ovens seem to deliver the same purpose – to cook and bake your meals. However, each one has unique capabilities that other ovens may not deliver in the same way. Consider the Hamilton Beach Countertop Oven with Convection and Rotisserie. This is a modern-day electric oven that can perform multiple tasks. It can be used for baking pizzas and muffins, for roasting chicken, and for cooking a wide variety of baked dishes. It comes in an elegant, stylish and modern design perfect for your countertop. It is actually a great addition to a modern kitchen. The question is; how functional and efficient is it? Will it meet your expectations? Let’s find out. 1. The Hamilton Beach Countertop Oven with Convection and Rotisserie lives up to its name. 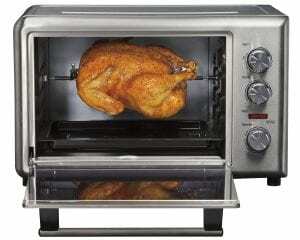 It is a small oven and rotisserie which can fit standard countertops. With actual dimensions of 13.11″ (height) x 20.62″ (width), it can conveniently fit two 12-inch pizzas or two 9 x 13-inch cake pans or casseroles. 2. It is perfect for cooking and preparing food for an average size family or around 5-7 persons. It is ideal for home use because of its practical size, capacity, and specific purposes. It also has a revolving rotisserie that can easily fit a 5-pound chicken and cook it evenly from all sides. 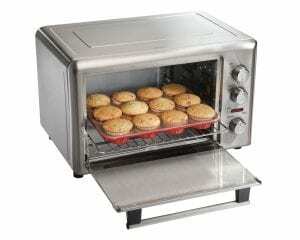 If you love baking muffins and cupcakes, this oven can also do the job. Other meals that you can prepare are casseroles, baked pasta, baked potatoes, healthy chicken breasts, steak, and baked pork chops among many others. 3. The versatility of the Hamilton Beach Countertop Oven goes beyond its cooking function and over-all aesthetics. The convection feature also bakes faster compared to conventional ovens. This can save you time and effort in meal preparation if you have a busy lifestyle and tight schedule. 4. Equipped with a two-hour timer for bake and broil, you have the option to control the cooking time without having to worry about burning anything. For example, you can conveniently set the time to 1.5 hours to perfectly roast a chicken or 45 minutes to bake cookies. 5. The accuracy of the temperature knob is also impressive. You can conveniently set the time, function, and temperature without the frills. It has a power light indicator and a timer function that automatically shuts off after your desired setting. 6. The controls are also very simple. The simplicity of its design and features makes it ideal for uncomplicated, fast and efficient cooking at home. It makes it so much easier to bake, broil and roast anytime. You can control everything that is in your food and this adds up to the joy of home cooking and meal preparation. Cleaning is also a breeze because of its non-stick interior. After highlighting the strengths and advantages of the Hamilton Beach Countertop Oven with Convection and Rotisserie, it is time to uncover its weaknesses and disadvantages. 1. Realistically speaking, this countertop oven is not really small. It is an average-sized oven that can be used on the countertop – if you have enough space, that is. However, if you have a limited space on your counter and your kitchen lacks enough surfaces for work area, this may not be the perfect oven for you. The size of this oven is bigger than what you might expect. Check out the dimensions first and make sure you have enough space in your kitchen to make room for this item. 2. This oven is not ideal for baking cakes. You could try; but it will not deliver the fluffy, soft and evenly-cooked cake that you are expecting. One usual problem that you can expect is that the middle of the cake is not cooked through. Although the convection setting works pretty well with muffins and cookies, the same results cannot be expected from a cake. In some cases, the cake will not rise at all or the middle portion remains under-cooked. 3. Another drawback is toasting bread in this oven. It does not toast evenly and most of the time, one side gets burned. This oven does not deliver the same results you can get from a conventional oven toaster when toasting a bread. One thing you can try is to toast your bread using the convection setting and then set to a lower time. It is all about going through the process of trial and error until you master the art of using its control for a variety of uses. 4. Another minor issue that you might have are the small labels/writings on the dials. This could be a concern if you hate reading small writings on your kitchen tools and aides. Others prefer digital ovens because of this problem. Also, the metal portion under the handle tends to get too hot. This could be a problem, especially for such movable part. You can literally hurt your hands and even get minor burns from holding this piece of metal underneath the oven door handle. 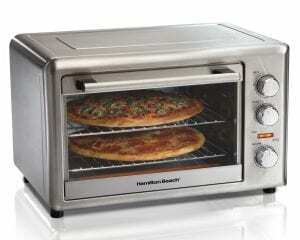 Overall, the Hamilton Beach Countertop Oven with Convection and Rotisserie is a decent and fully- functional oven that promises value for money. It is ideal for household cooking and meal preparation, but NOT for commercial use. It is big enough to cook for an average size family or group and serves multiple purposes as well. It may not be ideal for general baking purposes but it works perfectly in baking pizzas, pasta, muffins and in roasting and broiling meats. It is a wonderful kitchen ally as long as you have enough space for it. 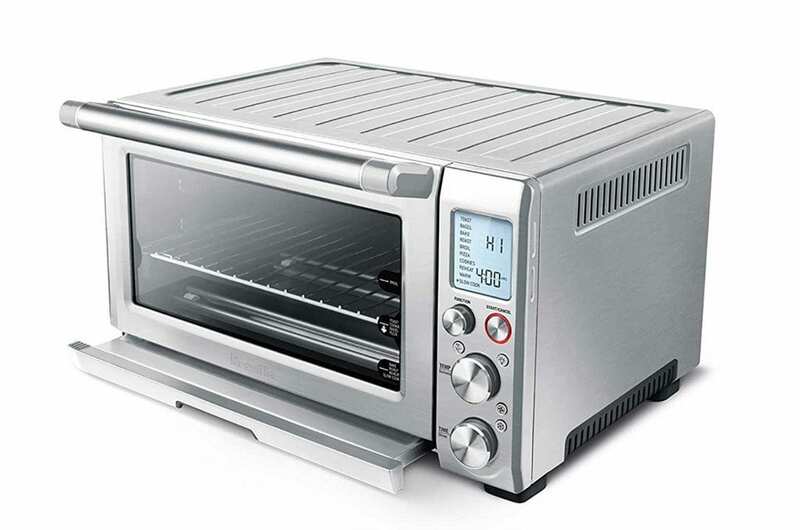 The Hamilton Beach Countertop Oven is a perfect holiday gift or present. You can give it to a loved one, or even to yourself as a treat so you can start preparing your own healthy and delicious meals at home the easy way. It is highly useful, versatile, and very affordable considering its multiple features. This oven is a great and practical addition to any kitchen. Discover the wonders it can bring to your table and to your lifestyle now. Do check out the oven and let us know how you liked it! If you have any further questions or want to share your experiences with the oven, then leave them in the comments section below. If you are looking for a fun pizza maker then the Pizzarette Counter Top Pizza Oven review should be something you go through because this pizza maker here makes making pizza a lot more fun. The Pizza maker here has a terracotta dome-shaped surface as well which gives the pizzas a really nice flavor and to know about all the other features let’s get into the detailed review. 1. The Pizzarette pizza maker might look a bit complex but it is actually easy to install and once you set it up, all you have to do is plug it in and it is ready to use. The Pizza maker comes with spatula hence you can easily put the pizzas inside the pizza maker and easily remove them as well once it is cooked. 2. The pizza maker is easy to use and you can keep it on your dining table so that the entire family can insert pizzas with their own favorite toppings and once the pizza is cooked you can easily remove it using the spatulas that come with the pizza maker. This pizza maker is perfect for family gatherings and it would take less than 5 minutes for your pizza to get ready. 3. The terracotta dome-shaped lid gives the ready nice taste and texture to the pizza. You can cook 6 small pizzas at the same time and this makes cooking much more efficient. You even have the four-person model in the same pizza maker where at once you can cook four small pizzas in the pizza maker. 4. The pizza maker has a heating element on both the bottom and the top hence it can provide with dual heating which ensures that the pizza is cooked well. The base is crispy and the cheese is gooey with perfectly cooked toppings making the pizza maker worth every penny and even more. 5. The Pizza maker can be used to make large pizzas as well, just that when it is cooked you might have to remove the lid in order to access the pizza. The fun way would be to make individual 6 small pizzas but it can get annoying if you want a large pizza hence removing the lid to put the pizza and remove it would be the solution if you plan on making a large pizza. 1. Honestly, there are not too many downsides to the pizza maker and most of the users are really happy and satisfied with their purchase. Overall, the pizza maker is perfect for the investment and it can easily last you for a year or even more without any problems. Honestly, this was one of the pizza makers that were really fun to review and you are going to have tons of fun even when you use it at your family gatherings. You can just keep the pizza dough and the toppings ready and everyone can have their own custom-made pizzas. The pizza maker is perfect when it comes to cooking crisp pizza at the bottom with gooey and cheesy toppings. The whole concept of the pizza maker is pretty good and if you are looking for something that would light up your gatherings and make the entire pizza making the concept more social then you definitely need to get one of these. If you have used this pizza maker then let us know your experience in the comments section below as it is always fun to read other’s experiences and stories. If you liked the post and found it helpful then do share it with your family and friends on social media.